Designer Joseph L Lee states, "Working at Avalon was a wonderful pleasure for me. We had available a large tract of land with the biggest stand of hardwoods that I have ever worked with and some beautiful valleys that allowed us to create outstanding natural looking golf holes. 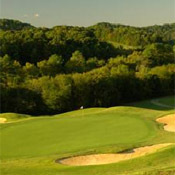 The owner gave us unrestricted use of the property to develop the best golf course possible. This allowed us to plan a number of holes with high tees that give a player complete command of the golf holes. This versatile piece of property also contained an area that was receptive to rather large spring fed lakes, which I worked into the design of several golf holes. Geographically, it is as fine a piece of property as we have ever worked on, and I am extremely proud of the results."